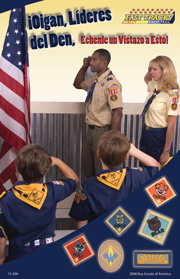 IRVING, TX: The Boy Scouts of America is increasing overall outreach efforts to prepare for its 100th Anniversary in February 2010, including a new focus on the Hispanic community. The Hispanic part of the program is currently focusing on six pilot areas – New York; Chicago; Orlando, FL; Fresno and San Jose, CA; and South Texas – and will expand nationwide in the third quarter of 2009. The Boy Scouts hired Hispanic Communications Network (HCN) as its Hispanic AOR for the campaign, and the firm began research and strategy planning 18 months ago. “It includes everything from attracting, retaining, and promoting [Latino] executives within [Boy Scouts'] staff, to increasing the membership ranks of Latino youth, to getting more Latino parents involved,” said Carlos Alcazar, CEO of HCN. The Boy Scouts also plan to partner with Latino advocacy and service groups. For the broader, national outreach, the Boy Scouts is emphasizing the benefits of involvement in Boy Scouting, including gaining leadership skills and learning to overcome obstacles, as well as its continued growth in technology, like using GPS systems instead of compasses. It hired Fleishman-Hillard as AOR for the general market about a year ago. It also works with Edelman for crisis communications. Fleishman is aiding the organization with a variety of PR tactics, including media relations, partnerships, events, and online outreach. In addition to Scouting.org and its 100th Anniversary microsite, the organization is developing pages for Facebook and Twitter, and plans to open up its CEO's internal blog to the public. “We really do see this 100th anniversary as an opportunity... to reintroduce Scouting... and define who we are as an organization,” Medlicott said.